Today was one of those days where I just couldn't get my head of steam going. Some days are better than others and I can't always put my finger on the reason why, but I think that today it was pretty clear that I had just burned myself out yesterday pushing to Guffey. 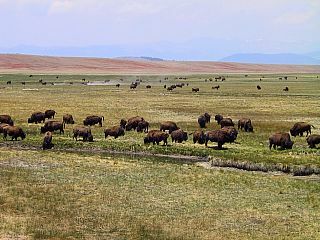 The morning's ride took me past vast ranches where bison and cattle grazed, and as my body warmed up my mind was mulling over how far I wanted to pedal today. On the one hand I only had to ride 42 miles to Fairplay to stay on my schedule, on the other hand the closer I drew to Fort Collins the more I heard the siren's song of relaxation. Since I wasn't able to form any sort of plan that satisfied both my fatigue and my desire, I opted to simply leave it up in the air. A few hours later I got to the small town of Hartsel, which according to the waitress I talked to has a population of between 75 to 100 "depending on who is in jail". The cafe here was run by a couple of displaced Nevadans who gave me a special desert-rat discount on my lunch. And while my bison cheeseburger didn't help me decide how far I was going today, it at least gave me the energy to push on to the next town. In Colorado parlance, a "park" is a broad basin ringed by mountains. For those of you who are cartoon fans, South Park doesn't really refer to a specific town but instead to the region I was now riding through on my approach to Fairplay. This was the minimum destination I had set for myself today, and as the storm clouds lingering overhead broke open with rain and pea-sized hail I thought that perhaps it was a fitting stopping point for the night. Seeking immediate shelter from the storm, I ducked into the Brown Burro restaurant and started on my second lunch of the afternoon. While I lingered over my meal the wind pushed the storm away and I weighed my options. Fairplay didn't offer any accommodations that were particularly attractive to me and there were many hours of daylight ahead. On the other hand, leaving town meant starting the climb to the highest elevation of my entire trip. 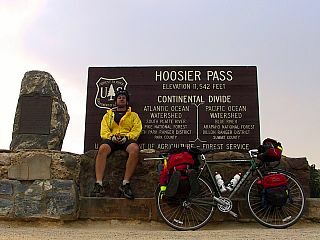 I'm not sure exactly how I made my mind up, but somehow I found myself back in the saddle with my front wheel aimed for Hoosier Pass. The next three hours and twelve miles were spent climbing. With my energy and motivation already low, every quarter-mile that clicked by was reason to celebrate as my muscles resisted every turn of the cranks. Foot by foot I ascended higher and higher, until finally I was there. At 11,542 feet I was standing as close to the rooftop of the world as this journey will take me, and I stopped for a while to rest my legs and celebrate my accomplishment. The final twelve miles to Breckenridge whizzed by as the road flew back and forth from switchback to switchback, and I honestly think I could have stopped pedaling back at the pass and coasted all the way into town. Once I had my accommodations arranged and a light supper in my belly, I collapsed into my bunk for the night, all but dead to the world. I'm telling you, death ride would be no problem after yesterday's grind. Plus you get a cool hat pin when you finish with a little skull on it. westward Ho! Oh heck, who knows. If I can do this with a loaded bike it makes me wonder what I could do once I ditched my gear. Still, the 16,000 feet of climbing on the Death Ride is over twice what I've done in a single day so far. That's some beautiful country you just rode through. I've always really enjoyed South Park and the areas around Fairplay.